We, at the Centre for Science and Environment (CSE), New Delhi, are truly proud of you and your achievements. You are an icon for the youth of India. Millions of young women and men aspire to emulate your success. They are influenced by your actions and messages. Having said this, we are deeply disappointed that you have associated yourself with a blatantly false and misleading advertorial issued by the All India Poultry Development and Services Private Limited (AIPDSPL), featured on the front page of The Times of India, New Delhi edition, on February 27, 2018. In the advertorial, you seem to be endorsing a claim that the Indian poultry industry is using antibiotics only for the treatment of chicken (therapeutic use) and that there is no misuse of antibiotics. The advertisement also quotes a 2014 study of CSE to support a claim that antibiotics are not indiscriminately misused in poultry farms, and that the chicken produced in India is absolutely safe to consume. This information is false, misleading and libelous. The truth of the matter is that antibiotics are rampantly misused in India by the poultry industry to fatten chicken in less time and with less feed for commercial gains. They are routinely given to all birds in the name of disease prevention, even in the absence of any clinical signs of disease. This is a well-known malpractice; CSE has consistently brought this fact to public attention through extensive studies conducted over the last several years. Even the government acknowledges the problem of antibiotic misuse in the poultry sector. Our 2014 study, which the AIPDSPL has completely misrepresented, had found that banned, critical and highly prescribed antibiotics are being misused by the poultry industry. Similarly, a study done by us in 2017 drove home the point that the misuse of antibiotics is turning our poultry farms into breeding grounds of superbugs. Tests conducted by our laboratory found that bacteria like E coli from the poultry farms were 100 per cent multidrug-resistant. Predictably, the AIPDSPL has conveniently decided to ignore this latest study of ours in its advertorial. Recently, companies like Venky’s have been indicted for selling Colistin to poultry farms. Colistin is a last-resort antibiotic—when all antibiotics fail, it is used to treat life-threatening infections. The World Health Organization (WHO) has put this and a few other antibiotics in the category of “critically important to humans”, so that they are restricted for use in animals. Yet, it is freely available and used in the country to fatten chicken. The misuse of antibiotics in food and poultry industries is accelerating antibiotic resistance (ABR). Resistant bacteria from animals are now causing drug-resistant infections in humans. ABR is now considered as one of the world’s biggest health threats. The threat is so serious that countries came together in September 2016 to fight antimicrobial resistance at the UN General Assembly. All around the world, many common infections are becoming resistant to antibiotic medicines used to treat them, resulting in longer illnesses and more deaths. At the same time, no new antibiotics have been developed since 1987 to replace older and increasingly ineffective ones. It is estimated that every year, 0.7 million people die worldwide because of ABR and the death toll is expected to rise to 10 million by 2050. Unfortunately, India has one of the highest rates of ABR because of poor sanitary conditions coupled with the misuse of antibiotics. We are writing to apprise you that knowingly or otherwise, you have been part of an endorsement that is based on false and misleading information. 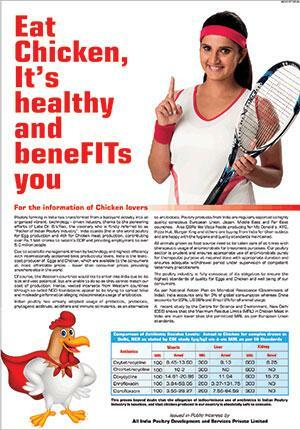 The advertorial is aimed to benefit the poultry industry by misguiding the people of this country. As a celebrity, what you endorse has a huge impact on choices that people make. We urge you to exercise greater caution and be more sensitised and responsible towards products/ideas/claims that you choose to endorse, specifically if they have public health significance. We hope you publicly disassociate yourself from this advertorial of AIPDSPL.